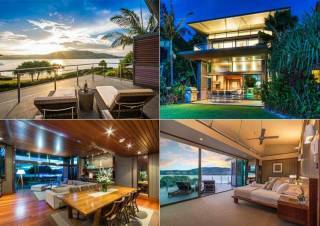 Perched on the top of the ocean’s edge, Villa 12 is as close to the natural beauty of Hamilton Island as you can get. Breath taking views through the floor to ceiling windows and doors mean that you are always surrounded by the vista of the ocean beneath the ever-changing skyline. 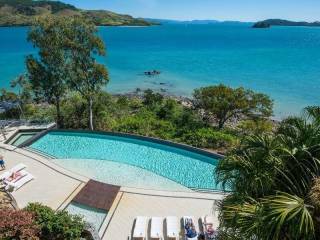 This three bedroom, two bathroom villa caters for up to eight people, and is the perfect spot from which to enjoy the very best that Hamilton Island has to offer. Situated within the premium The Edge resort complex, Villa 12 offers privacy, comfort and superbly designed living spaces with all the right amenities to ensure your unparalleled holiday experience. Capturing a wonderful indoor-outdoor flow, the villa is designed over two levels and maximises space and light in such a way as to give an overall impression of expansiveness and comfort. From the spacious and airy main deck, complete with enough dining seating for eight people, a bar table and a state of the art BBQ to the airy, high ceilinged living, dining and kitchen area, where all the comforts of home are at your fingertips, this villa offers seamless summer living. The modern, fully equipped kitchen comes complete with top European appliances, including a large gas stove and oven, large microwave, dishwasher and family size fridge freezer with ice maker and water dispenser. The kitchen also offers all the crockery, cutlery, cookware and glassware you will need throughout your stay. The dining area is furnished with a long dining table that easily seats ten, while the lounge area has comfortable couches ideal for relaxation or for watching one of the complimentary DVDs on the large flat screen wall mounted television. Upstairs you will find the master bedroom which features a comfortable king bed, bedside tables and lamps, LCD Television and DVD player, and opens onto a decked balcony with breath taking ocean views where you can enjoy your breakfast and morning coffee. This bedroom comes with a modern ensuite, which features a luxurious spa bath, dual showers and dual sinks. The second and third bedrooms are also beautifully furnished, with the second bedroom offering a queen sized bed, while the third bedroom provides a choice of either two single beds or another queen sized bed. In addition, there are two quality single fold out beds, making this the perfect villa for larger families or groups. A complimentary port a cot and high chair are also available for those youngest of guests. There are plenty of outdoor activities to enjoy at The Villa 12, whether it is soaking up the sunshine on the private decks of your villa, swimming at the beach, or taking a splash in the stunning Edge infinity pool, which comes with spa pools at both ends. As the villa offers a complimentary electronic golf buggy you are never far away from the rest of the action – one minute by golf buggy or a five minute walk away you will find the marina, restaurants, cafes and shops. There is also a complimentary bus that circulates the island around every half hour, which stops not far from your front door. No matter whether you are looking for a fun-filled family holiday, a relaxing and romantic escape, or a catch up with your large group of friends – Villa 12 The Edge is the perfect place to host that once in- a –lifetime holiday experience that you won’t soon forget. 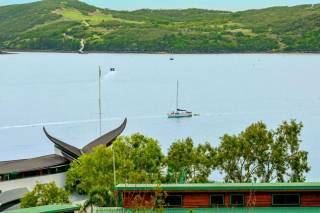 For your added security, this property, Villa 12 The Edge is only managed in Australia and we never request payments be made to overseas bank accounts.